I did it again. Lost our camera. Only 16 months after the last time. There is something seriously wrong with me. Cameraitis, perhaps. And it’s a shame, too. Because yesterday was an absolutely beautiful day and I had some great pictures of the girls at the different presidential memorials. 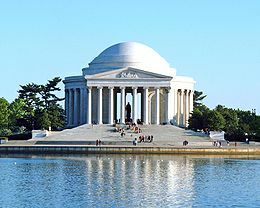 Instead, you’re stuck with a stock photo of the Jefferson Memorial. Sorry. But enough dwelling on my perpetual state of distractedness. It was a day of walking, and walking and walking. We started out at the Smithsonian metro stop and walked to the Bureau of Printing and Engraving to pick up tour tickets for later in the afternoon. From there, we walked to the Jefferson Memorial, the FDR Memorial and the Lincoln Memorial. We then meandered along the Reflecting Pool, waved hello to Obama from the Ellipse, and walked back to the Bureau of Printing and Engraving, where we saw the employees inspecting the new $100 bill. And lest I forget, we strolled right past Richard Branson while crossing a street near the Department of Agriculture. Who would’ve thought – one of wealthiest men in the world, walking alone, without a coterie of assistants. As I later learned (I thought I was hallucinating when I saw him), he was apparently in town during Earth Day celebrations to launch his new venture, the “Carbon War Room,” which aims to encourage businesses to go green. All told, we walked approximately 4.5 miles yesterday. And if I had to venture a guess, a total of about 15-20 miles during our entire visit. Was I proud of my girls? You bet. Did they complain? You bet. But not nearly as much as I feared they would. Next vacation, hiking the Appalachian Trail. We start training tomorrow.